It's Baaaack! Get ready for a whole afternoon of fun on Saturday, May 11th for the 2013 edition of Crawfish Craze at “Bayou Allatoona.” Please read all the event details below. As always, you need to order in advance for your required admission and any quantity of 3 lb. and 5 lb. platters of crawfish you desire. After a successful event last year, we are bringing back the FREE admission for members! If you are a current dues paying member of LSU Atlanta you get one free adult admission (2 adults for a Family membership)! Everyone needs to pay or register for admission, so if you are not a member, this is a great time to join (do it here). Admission includes a sumptuous Cajun Buffet provided by our great sponsors, one free raffle ticket, and live music by The Electromatics, a hot blues band featuring New Orleans sounds and sponsored by Duffy Realty of Atlanta. Take I-75 north to Red Top Mountain Road exit 285. Turn LEFT over the interstate and go .8 mile and turn RIGHT at Red Top Mtn. Connector for short jog to US 41 NORTH. Turn RIGHT (north) on US 41 and go approx. 1 mile to the first real road, Allatoona Dam Rd. Turn RIGHT and it takes you right into the park after approx. one mile. When you enter Riverside Park you will see a parking lot on each side of the road and the pavilion is on the left. ORDER YOUR CRAWFISH PLATTERS BY 7 PM MONDAY, MAY 6TH TO GUARANTEE YOUR MUDBUG ORDER. We have to make our order Tuesday - late requests cannot be guaranteed and will be fulfilled in order of request. There is a chance some crawfish will be available on day of event, but this is not promised or assured. Thanks for your understanding! AGAIN this year - if you are a current dues paying member of LSU Atlanta you get one free adult admission (2 adults for a Family membership). Everyone needs to pay or register for admission, so if you are not a member, this is a great time to join (do it here) You don't have to be an alum to be a member of LSU Atlanta and we are planning some great new benefits coming later this year. Expect another GREAT party in the country. More details coming in March - Mark your calendar NOW! 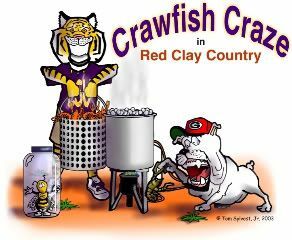 2012 Crawfish Boil 4/21 - Best Event of the Year! It's Baaaack! Get ready for a whole afternoon of fun on Saturday, April 21st for the 2012 edition of Crawfish Craze at “Bayou Allatoona.” Please read all the event details below. As always, you need to order in advance for your required admission and any quantity of 3 lb. and 5 lb. platters of crawfish you desire. UPDATE 4/20: Online pre ordering is closed. To inquire about crawfish availability and late admission, please email events@LSUatlanta.com and give your direct phone number so a board member can get in touch to let you know what's available. UPDATE 4/12: ORDER YOUR CRAWFISH PLATTERS BY 7 PM MONDAY, APRIL 16TH TO GUARANTEE YOUR MUDBUG ORDER. We have to make our order Tuesday - late requests cannot be guaranteed and will be fulfilled in order of request. There is a chance some crawfish will be available on day of event, but this is not promised or assured. Thanks for your understanding! NEW this year - if you are a current dues paying member of LSU Atlanta you get one free adult admission (2 adults for a Family membership). Everyone needs to pay or register for admission, so if you are not a member, this is a great time to join (do it here) You don't have to be an alum to be a member of LSU Atlanta and we are planning some great new benefits coming later this year. Admission includes a sumptuous Cajun Buffet provided by our great sponsors, one free raffle ticket, and live music by The Mar-Tans, a hot new band featuring New Orleans sounds and sponsored by Duffy Realty of Atlanta. Thanks to sharp-eared LSU alum Harold Engler, we were alerted to a new band in Atlanta called The Mar-Tans that prominently features the sounds of New Orleans and Memphis in its repertoire. And thanks to our Champion Sponsor Duffy Realty of Atlanta, we are able to bring The Mar-Tans to the 2012 edition of "Crawfish Craze in Red Clay Country" on Saturday, April 21st at Bayou Allatoona (Corps of Engineers Riverside Park at Lake Allatoona). Mark the date, more details and opening of sales will come over the next week. The Mar-Tans may be a new band, but it is composed of seasoned professional musicians. Several members have played together for over 15 years. Check out these two clips "The Second Line"and "Sadie/Iko Iko Medley" on Youtube from their debut show. Keyboardist Matt Wauchope loves the piano styles of New Orleans and clearly has the likes of Huey Smith and Professor Longhair nailed down. "If they're half as good as they sound in the clips, Atlanta has a great new band and we're in for a really good time," says New Orleans native Frank Duffy of Duffy Realty. In addition to sponsoring the band, super agent Rhonda Duffy will also contribute her professional auctioneering skills for our live auction. Rhonda and Frank sell houses. The Mar-Tans may bring the house down. Watch for more Crawfish Craze news SOON!